Includes transducer for built-in Garmin CHIRP traditional sonar plus CHIRP ClearVü and CHIRP SideVü scanning sonars. Built-in Quickdraw Contours mapping software lets you create and store maps with 1’ contours for up to 2 million acres. ​Garmin Quickdraw Contours: Nobody knows the waters you fish better than you and your fellow fishermen. While you are trolling the shorelines and the depths, Quickdraw Contours mapping software creates HD fishing maps of the places you’ve been. No special knowledge is required. STRIKER Plus 7sv can now store up to 2 million acres of your Quickdraw Contours maps with 1’ contours. ActiveCaptain App: STRIKER Plus 7sv features built-in Wi-Fi, so you can pair with the free, all-in-one ActiveCaptain app. Once paired, you can get smart notifications1 right on your screen. You can also access the Quickdraw Contours Community to share some of your new maps or download new data from the community. You’ll even be able to get updates for your fishfinder using the Wi-Fi connection and the ActiveCaptain app. 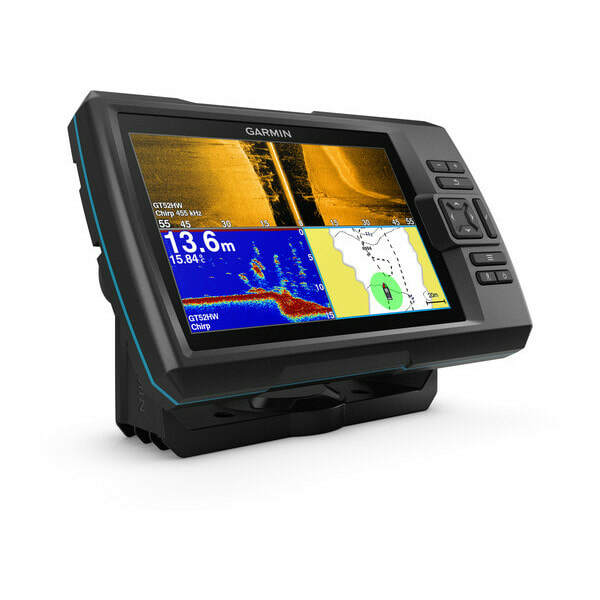 Clear Scanning Sonar Images: Garmin ClearVü™ scanning sonar gives you a nearly photographic, wide image of what passes below your boat. Garmin SideVü™ scanning sonar gives you a crisp, clear view of what lies off to each side of your boat. You clearly see structure, submerged objects and fish. Garmin CHIRP traditional sonar provides remarkable target separation. All this sonar technology is combined into 1 transducer to help you catch more fish. GPS Fishfinder: The built-in, high-sensitivity GPS finds and maintains your position anywhere you go on the water. The GPS allows you to mark waypoints for different locations. So, if the fish are biting in 1 spot, you can mark it, and return to it on your next trip. Mark docks, boat ramps and other locations on the lake, and create routes back to them for your next trip. GPS also allows STRIKER Plus 7sv to show your speed on screen, so you can be sure you’re trolling at the right speed for the lure you’re using or in wake-controlled areas. Built for You: The STRIKER Plus 7sv fishfinder makes fishing a breeze, and it’s built to work in any environment. The bright, sunlight-readable display gives you a clear view of what is below your boat, even on the brightest days. And the larger screen gives you a better view of what is happening below the boat. The intuitive user interface makes it simple to navigate to whatever feature you need, so you are ready for anything on the water.